I didn’t realize it at the time, but that day, Sunday, June 29, 1975, was pivotal. It was the first time in history anyone had typed a character on a keyboard and seen it show up on the screen right in front of them. 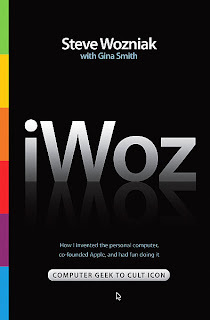 Steve Wozniak’s memoir (co-authored by Gina Smith), “iWoz” is a great book for several reasons. It’s generally well written. It gives a nice overview of the history of the computer buisness in the 70s (and is a great compliment to Andy Grove’s, “Only the Paranoid Survive”), and it tells us a lot about Woz as a person. It’s a book with great geek appeal. If you want to learn more about Apple’s design or marketing practices, this is a not the book for you. The recent Steve Jobs biography may be a better choice for that; Woz was largely done with Apple’s day-to-day operations when Apple became a design house. This book is more about the early days of the PC business and the evolution of electronics. The biggest negative about this book is that at times Woz and coauthor Gina Smith seem to ramble or repeat things unnecessarily. While mildly annoying at times, this doesn’t really detract from my enjoyment of the book. The thing that stands out most for me is how Woz can talk about how smart he is and how his inventions changed the entire industry and the world, and he does that without sounding arrogant or like he’s bragging. There is an innocent, matter-of-factness to his stories that is both amazing and charming. I don’t think I’ve ever seen someone else pull that off. So right there in that bowling alley I suddenly had this cool new goal. I was going to go back and start thinking about my first design that was actually going to put characters on a TV set. I remember how, way back in high school, I wondered how, if I ever did a computer, I would ever be able to afford one that could ever display characters on a screen. That was unfathomable back then. But now, I knew, something was different. So I designed this game Breakout. That was amazing because back then color TVs operated with circuits a lot more complicated than any computer was back then. And the funny thing is, that very idea came to me in the middle of the night at that lab at Atari. I did no testing on it, but I filed it away in my memory, and eventually that was exactly how things like color monitors ended up on personal computers everywhere. Because of my wild idea that night. Every computer before the Apple I had the front panel of switches and lights. Every computer since has had a keyboard and screen. That’s how huge my idea turned out. The Apple II was the first low-cost computer which, out of the box, you didn’t have to be a geek to use. Woz’s father was an engineer in the Bay-Area aerospace industry, and he encouraged his son to learn the field where transistors were still new and computers were mamoth things fed by punch cards. Engineering wasn’t just a good living -- it was a calling. There was a beauty and elegance to electronics and engineering. Technology was an end in and of itself. I so clearly remember him telling me that engineering was the highest level of importance you could reach in the world, that someone who could make electrical devices that do something good for people takes society to a new level. He told me that as a an engineer, you can change your world and change the ways of life for lots of people. And I came to that same view when I was very young, ten or maybe younger. Inside my head -- and this is what has really stayed with me -- I came to the view that basically, yes, technology is good and not bad. People argue about this all the time, but I have no doubt about it at all. I believe technology moves us forward. Always. As Woz grew up, he quickly picked up on computer programming. This discussion is interesting in a couple of respects. One is that he grasps the technology so enthusiastically. The other is the way he breaks down digital technology to the basic math. Here’s what was amazing to me back then. I thought to myself: Hey, at my current level of fifth-grade math, I am able to learn math used by a computer -- De Morgan’s Theorem, Boolean algebra. I mean, anyone could learn Boolen algebra and they wouldn’t even need a higher level of math than I already had in fifth grade. Computers -- were kind of simple, I discovered. And that blew me away. Computers -- which in my opinion were the most incredible things in the world, the most advanced technology there was, way above the head, above the understanding, of almost everyone -- were so simple a fifth grader like me could understand them! I loved that. I decided then that I wanted to do logic and computers for fun.I wasn’t sure if that was even possible. This is one of the things that many people overlook about computers -- they all work on very basic principals of math. They’re nothing but collections of light switches where everything is on or off. The entire digital world economy is based on this simple construct. And those switches will only do exactly what the user and programmer tell them today. Woz continued to develop his skills in technology. He developed such a deep affinity for technology, that eventually he could actually write in machine code. This 1 and 0 program could be entered into RAM or a PROM and run as a program. The hitch was that I couldn’t afford to pay for computer time. Luckily, the 6502 manual I had described what 1s and 0s were generated for each instruction, each step of a program. MOS Technologies even provided a pocket-sized card you carry that included all the 1s and 0s for each of the many instructions you needed. So I wrote on the left side of the page in machine language. As an example, I might write down “LDA #44,” which means to load data corresponding to 44 (in hexadecimal) into the microprocessor’s A register. On the right side of the page, I would write that instruction in hexadecimal using my card. For example that instruction would translate into A9 44. The instruction A9 44 stood for 2 bytes of data, which equated to 1s and 0s the computer could understand: 10101001 01000100. Writing the program this way took about two or three pieces of paper, using every line. Woz developed a particular knack for simplifying hardware and software designs. Whether due to the cost of chips or just the challenge of technology, Woz would redesign and improve systems by removing chips and simplifying code. He also approached it all as a learning opportunity. A lot of what he accomplished he did because it was something he didn’t necesarily know how to do. The reason he can talk about his accomplishments without it coming across as excessive bragging is that he never seems to act like he knows everything already. He’s perpetually curious. This plywood was covered with parts and it was a huge project. And having a huge project is a huge part of learning engineering -- learning anything, probably. That made me realize that a million times a second didn’t solve everything. Raw speed isn’t always the solution. Many understandable problems need an insightful, well-thought-out approach to succeed. The approach a program takes to solve something, the rules and steps and procedures it follows, by the way, is called an algorithm. His desire to push the boundaries of technology wasn’t his only motivation. There was also the more basic need he felt, born from his own shyness. Communicating with people was always a challenge for him. He faced the traditional nerd challenge of making friends and building relationships. Technology was his solution to the problem. In that sense, it was a great way to show off my real talent, my talent of coming up with clever designs, designs that were efficient and affordable. By that I mean designs that would use the fewest components possible. I also designed the Apple because I wanted to give it away for free to other people. I gave out schematics for building my computer at the next meeting I attended. This was my way of socializing and getting recognized. I had to build something to show other people. Woz also talks about his love for practical jokes. In college he discovered he could jam a TV signal in a rec room with a device. He would turn it on, the signal would go out, someone else would get up to try to fix it, Woz would turn off the device and really confuse people. So anyone watching would think that, okay, hitting harder works better. They all thought something was loose inside the TV and that by hitting it hard with your hand you could fix it. It was almost like a psychology experiment -- except, I noticed, humans learn better than rats. Only rats learn it quicker. At one point he started getting phone calls from people who were trying to reach and airline. Woz started having fun with them. I told some caller they could fly “freight.” But they had to wear warm clothing. I kept a straight face because everyone always went for the lower fare. At some point I started telling them it was cheaper to fly on a propeller planes than jets. The first time I did this I tried to book a guy on a thirty-four hour flight to London. But he would have nothing to do with it. I did get a number of people to buy a cheap twenty-four hour flight form San Jose to New York City. Woz tells more about the early days of Apple, his relationship with Steve Jobs, his endeavors after leaving day-to-day operations at Apple, his family life and more. I’ve only scratched the surface here. 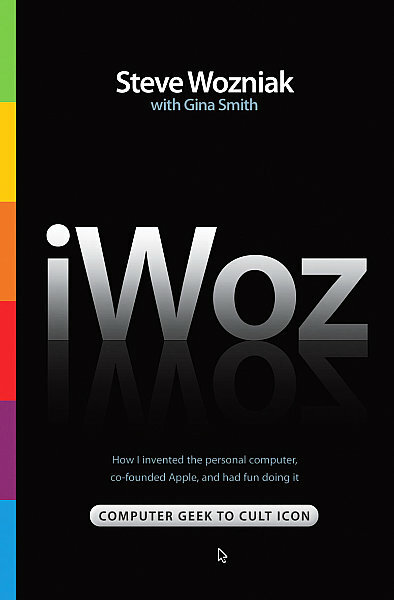 Regardless of your feeling about Apple as an organization, this is a fantastic book, and Woz has had a fascinating life. Despite the occasional bit of rambling and redundant content. “iWoz” remains an excellent read. "Captain’s Log: William Shatner’s Personal Account of the Making of Star Trek V: The Final Frontier As Told by Lisabeth Shatner" is a fascinating look behind the scenes of the train wreck that was one of the 3 worst Star Trek movies in the franchise (Star Trek: The Motion Picture and Star Trek: Nemesis being the other two that vie for the title, depending on the day of the week). In this book, Lis Shatner spends time on the set chronicling the project from the initial development to the filming to the post production. She interviews here farther extensively, interviews the cast and crew about their experiences, and relates some of her own personal anecdotes about her complicated relationship with Star Trek. This is a great book to read. It’s a look at just how this movie got made, and about how it could have been so much worse. If you've read a bunch of the other Star Trek cast memoirs and William Shatner’s earlier books, you are likely already familiar with some of the stories. For example, we hear about William Shatner stealing Leonard Nimoy’s bike again. Still, there is new material, and some additional perspective in this book that are worth the read. If you haven’t read many other books about the franchise, this one is a great introduction and place to start. It covers some of the basic history of Star Trek production and how the franchise got to this point. If you find the material in this book interesting, then there are lots more Star Trek histories and memoirs to read for more details. Lis Shatner starts discussing the challenges of growing up as Captain Kirk’s daughter. She talks about trying to avoid the connection and distance herself from her life as a “Shatner” as you might expect from a teenager or college student. As a kid, though, it was always part of her life. When we got off, my father finally had had enough. “If I give you my autograph, will you promise to leave us alone?”he asked. “Yes, yes!” they cried, still jumping up and down. He hastily scribbled his signature on an eagerly proffered sheet of paper, and the girls magically disappeared. We were finally left as before, still trying to convince my mother to let us ride the Matterhorn. At this point in my life, I felt a strange ambivalence towards “Star Trek.” I knew much of my father’s success as an actor was because of the series, and for that I was grateful and proud. “Star Trek” had also made him the magical, famous father who could sweep me out of my misery. But it was also “Star Trek” that had set me apart in the first place, making me an outcast and the target for so much criticism. I often felt that I had no identity other that “Captain Kirk’s Daughter,” and even joked that those words would be engraved on my tombstone. A career in Star Trek often posed challenges for William Shatner’s family. He travelled extensively. It was hard to avoid fans. And his drive to always be working would sometimes distract him from personal concerns. The network almost didn’t air the original series in the sixties. The pilot’s plot was just not great. To here William Shatner tell it, his interpretation of the Captain Kirk saved the series and was responsible for it’s tone and direction. So I went back to Hollywood and saw this pilot. I saw a lot of wonderful things in it. But I also saw that the people in it were playing it as though ‘We’re out in space, isn’t this serious?” I thought if it was a naval vessel at sea, they’d be relaxed and familiar, not somewhat pedantic and self-important about being out in space. It seemed to me they wouldn’t be so serious about it. And the fact that I had come off all these years in comedy -- I wanted it to be lighter rather than heavier. So I consciously thought of playing good-pal-the-Captain who, in time of need, would snap to and become the warrior. I broached this idea to Gene, and it seemed to strike a note. So the story was written, the pilot made, and ultimately it sold. The next thing I knew, I was to play Captain Kirk on a weekly basis. Of course Shatner is making this movie more than 20 years after he created Kirk and he sought to portray the characters in a more serious manner and with greater symbolism. Of course, Kirk is always the most important one. “When they arrive on the planet the holy man has conquered, they try to reason with him. The reasoning escalates into fighting, and before it is over, the Enterprise is boarded by these primitives. No one can argue that William Shatner is not committed to his vision, however. He insists on doing dangerous stunts just so they look perfect. Lisabeth Shatner asked Leonard Nimoy to compare his movies to the one Shatner was now directing. Shatner learned a lot of lessons in his first major on location shoot as a director in the desert. To begin with, he had to learn that the actors weren’t the only people that mattered on a film. His occupation was just a small part of a production. Because the schedule was so tight and the budget so constrained Shatner did everything he could to get the shots he wanted and get them on budget. No one could accuse him of not working hard. Sometimes he worked a little too hard though and became too much of a control freak. He needed to learn not just how to communicate with non-actors, but to also let them do their jobs. My father’s distress gradually mounted as he watched several unsuccessful attempts, until finally he exploded and started yelling. In a half-joking gesture of frustration, he even flung himself down on the ground and pounded the cracked earth. Unfortunately, his dramatic gesture didn’t solve anything. “Basically what happened was Bill crossed the lines … he was pushing too hard,” Ralph said. “I told him, ‘Your passion for the picture is both a blessing and a curse. The passion is what excites the crew, they like working for you … you make them feel good, you have a good time with them. But the downside is, you create panic. You’re trying to do their jobs. Let them do their jobs. Let Mike Woods decide where the fan is going to go. You tell him the way you want the wind to be in the camera, and let him figure out where to put it. Forget it. You get all worked up about it and it creates problems. Then you’ve got four cameras going; four operators, four lenses. four systems, four different exposures, and it just can’t all happen in a second … if we come back from location and it doesn’t look like location, then what have we accomplished’? Nothing … we have to show the vistas. We have to show that we were here. If it takes longer, if it puts us overschedule by a day or two, let’s do it. Because that’s what makes the movie great. A Teamster strike complicated the film’s production. They had to use non-union drivers and other staff to get eqipment to location. The interesting aspect of this is that it highlighted the advantages of expereinced people because they lacked them here. Driving a truck and moving a wardrobe is about more than knowing how to drive and move things. Experienced staff develop other skills that don’t pop on a list of key skills. It’s about understanding the process and role better than those without experience. It’s about knowing what questions to ask and knowing all the “obvious” stuff that is only obvious with years of experience. And there’s value to that. The Teamsters are saying that it’s things like the expensive actors which are driving up the costs. So there is this dispute going on. But while some people may think the Teamsters are getting paid too much, the advantage is they very familiar with industry proceedings. They know to do certain things automatically, whereas people who haven’t worked in the business don’t. Another fascinating aspect of the desert filming is that we learn Shatner really had no idea what a unicorn is in popular culture. Granted, he’s Canadian, but I don’t think Canadian and American cultures are that different with regard to unicorns. And Shatner had been living in the US for decades. But in the original interpretation of Sybok (originally named Zar), Shatner sought to come up with a symbol of Zar’s violent and evil nature. And the best beast to represent that was the unicorn. In fact Shatner envisioned a battle scene where the unicorn spears a guy and then continues the battle with the guy’s body still impaled on its horn. However, in spite of making some of these major changes from the original story, they still kept some of the initial concepts my father had envisioned. The holy man, whom they called Zar, still was a relatively dark and violent character, who rode a unicorn throughout his interplanetary adventures. The unicorn was an extension of Zar’s violent nature, to the point where my father had envisioned a battle scene where the unicorn had speared an unfortunate soldier who lay writhing and screaming in agony upon the unicorn’s horn while Zar rode on in triumph. No one knew what color a Nimbosian horse (the former Unicom) was supposed to be, or at what height his horn should rest on his forehead. They went through several tests first painting the horses gold and placing the horn high up between their foreheads. After seeing the tests on film, it became apparent the gold color didn’t register well. The horses also balked at seeing the shadow of something strange between their eyes. Budget and story problems would continue to haunt the film, even up to its climax. It still seems strange that the studios exercise so much control over the budget. As we see blockbusters in the theater today, it often seems like controlling budget is an afterthought, but perhaps that’s how it looks from the outside. In this movie, the studio significantly reduced the scope of the ending, despite what Shatner wanted. Lisabeth Shatner also interviews other members of the cast. There are some fascinating discussions in there that illustrate the relationships among the actors. Deforrest Kelly seemed the most positive about the film. Since she is interviewing them in the middle of production, it’s a little hard to tell. The film may also have looked great to the actors during the creation of it. Q: What did you think of the script for Star Trek V? I think that it is interesting in that it’s entirely different from any of the others, which is refreshing. Four was a wonderful motion picture, and you think, what are you going to do after IV? My feeling about films is that you can never tell about them until they’re strung together and scored and you look at it. Very seldom do you ever hear anyone come back from dailies and say that the dailies look terrible. You don’t know until you see the final product. But in examining the script I thought that it had an awful lot of things going for it, and if it comes together the way we all hope it will, I think it’s going to have a little bit of something for all the Star Trek fans, and hopefully that thirty-five percent of the audience that we picked up in IV will enjoy it. We have a great deal of the humor of IV once again, there’s conflict, adventure, and some powerful drama. Walter Koenig seems resigned the fact that Chekov remains an under appreciated character. It’s also interesting how he sees it as film about taking control of your own life and destiny. Q: What do you think this film is saying? A: That ultimately you have to take responsibility for your life and for what occurs. I think that probably that’s what this picture is about... My feeling is that the principal statement of the movie is: You can’t rely on the supernatural and you can’t rely on forces beyond your control to shape your own life. You have to take it into your own hands. That isn’t to say you can’t have faith, religious faith, etc. But not to throw off responsibility and let some other entity assume it for you. I think this story—and I try to couch it in the most positive way—has to do with the three main characters. The supporting group is really ancillary to the story. … If it’s a story of family, it’s a story about the family of the three top guys. Maybe that’s supposed to be a microcosm of the greater family. Maybe it’s supposed to represent a larger type family, the entire seven crew members that the audience has gotten to know know, the entire Enterprise, the universal family. Maybe that’s part of the design in the screenplay. If indeed that is the case. it’s focused on the three main people, though. Q: What do you think your character will be remembered for? A: I don’t have the faintest idea … In several episodes and in three out of the five films, Chekov has suffered some kind of physical trauma [he laughs] and I am frequently asked “Why is Chekov always getting beat up?” I would like to think of Chekov as a character that has some sense of fun, that perhaps is not as institutionalized an officer as some of the others. That there’s some irreverence about him . . . and I don’t know what else to say because ; the opportunities have been limited as to how the character has been developed. Jimmy Doohan is relatively positive about the experience, or at least appears to be investing little personal energy in it. His answers lack the anger that comes through in his own book. Again that’s possibly because his is talking to Lis Shatner during the making of a William Shatner movie. That may have had a negative impact on his candor. He tries to treat it just like a job and he’s looking forward to his next vacation. Q: Any challenges in this movie? A: No, not really. I’m working. I’ve been an actor for forty-three years. At the end of twenty years, you’re supposed to be a complete actor. When I was about eighteen or nineteen. I started to feel that, because I’d been told that by my acting teacher. I said, “How long will it take?” And he said, “Well, depends on the type of work you get. It’s about twenty years.’ And you know what? I started to feel that, a sort of sense comes over you where you think, “Hey, I don’t care what they ask me to do, I can do it.” That’s the thrilling part of it .. And a powerful feeling, knowing full well that at this moment in the scene, even though you still have to rehearse it, they’re either going to be laughing about you making just one face or sound, or they’re going to be crying. Or all the feelings in between. That’s why when people ask me if I want to be a director, I say, “No way!”I’m satisfied being an actor. The rest of the time I’m terribly interested in seeing the country. My wife doesn’t understand why I want another motor home. Within twenty months, I drove 52,000 miles in one. I take trips to places like Phoenix and Portland and Sacramento, etc. and sometimes I’ll bring the whole family. I have six children all together. Four boys, two girls. Two boys are living with me in the San Fernando Valley. This book covers a lot of ground without being too long. The reader can get an idea of how this movie went off the rails while it was being made. It also has a nice bit of Star Trek history in it. It’s a worthwhile and fun read for anyone who wants to know more about the movie and the franchise in general. Experts in Star Trek may find little new ground, but the perspective is still interesting. “Captain’s Log: William Shatner’s Personal Account of the Making of Star Trek V: The Final Frontier as told by Lisabeth Shatner” is a worthwhile read. This case seems really shocking and appalling to me. Retired professor Julian P. Heicklen was arrested for telling passersby outside the Federal Courthouse in Manhattan about Jury Nullification. Jury Nullification is the philosophy that says a jury can vote "Not Guilty" in a criminal case if they disagree with the law, even if the the defendant actually broke it. It seems that ultimately the reason we have citizen juries is to provide a check on the combined power of our Executive, Legislative, and Judicial branches. If a juror doesn't feel the the defendent's actions are a crime deserving of punishment despite the facts presented by the state, it seems they have an obligation to vote "Not Guilty." There's a reason a jury is asked to vote "Guilty" or "Not Guilty." It's not asked to vote "True" or "False" on the prosecutor's case. Obviously, I'm not a lawyer, so perhaps my understanding of the issue is as thorough at that of legal philosophers. But the questions of nullification isn't the one I'm really concerned about here. It's that the government arrested someone for telling people about it. He wasn't targeting jurors on a specific case or even jurors specifically. He was talking to anyone out in public near the courthouse about nullification. It outrageous that someone can be arrested for talking about this outside a government building. These are ten of my favorites posts from 2011. They were fun to write. They aren't necessarily my highest traffic posts, or the posts that drew the most comments. If I compiled the list on a different day, the final selection might be different, but for now I'm satisfied. Of course, this year it was a little easier to compile them because I wrote substantially fewer this year. It will be interesting to see if I have to shift to a top 5 at the end of 2012.